Plush Casino is a site which has been built up in recent months having learned from the competition, offering a brilliant range of big name games from popular software developers and fair gaming enterprises. UP TO £500 WELCOME BONUS + 50 SPINS New Customers only, First Three Deposits only. 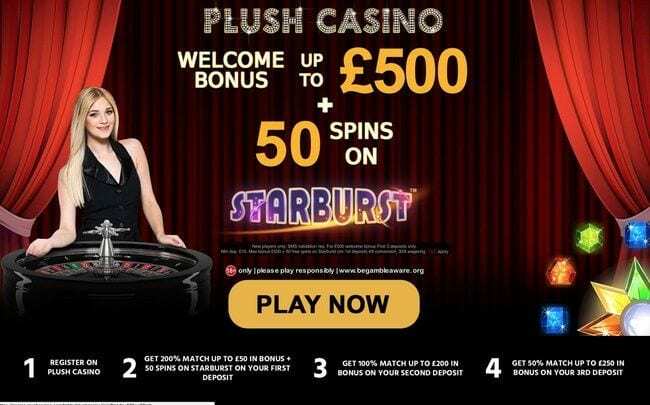 Minimum deposit £10, Max bonus £500 + 50 spins on Starburst. Selected slots only. 4x conversion, 30x wagering. T&C's apply. CLAIM BONUS New Customers only, First Three Deposits only. Minimum deposit £10, Max bonus £500 + 50 spins on Starburst. Selected slots only. 4x conversion, 30x wagering. T&C's apply. This is a superb site you are going to love if you are looking for a Plush gaming site. Great selection of games – Nektan once again pulling in some big names and developers. Lots of payment methods accepted. New games rolled out to players will keep things fresh and interesting. Very reasonable wagering will no doubt work wonders for seasoned gamers. At the time of writing, promotions and other features are somewhat limited – this is a site still in its infancy. It’s a site which is also offering a fairly competitive welcome offer, particularly as many mobile casinos tend to hold back a little in terms of the various promotions and bonus codes they offer. The bonus code available to new customers here is certainly intriguing – and we will cover it in a little more detail shortly. Its sister site, Plush Bingo is also available to sign up with if you prefer these games. Offering a site design which makes use of the current trend in sidebar navigation and flexible windows, this is a casino which is clearly designed to be enjoyed on portable devices – and, of course, we are all the more for it. The site’s games catalogue comprises of a number of big name games and interesting brands, meaning that it arguably keeps up with its Joneses – and Nektan is a Gibraltar-based firm who is known for pulling in big name developers to help embellish their catalogues. They are also well known for offering a fair approach to free bonus credit and to the games that they put up for display – meaning that, before you even get started, you know you’re likely to be in for a solid gaming experience that will pay well and keep you interested. Firstly, however, let’s take a closer look at that enticing opening promo code – and why we think it’s worth your while taking on that Plush Casino login while you can. The site may be relatively young, but bonus codes don’t stay valid forever! There is a huge welcome offer at Plush Casino in April 2019 with plenty of bonus codes surrounding it. A promo code may not always be needed, so make sure to see if a promo code is required before signing up. The site also offers a handful of other promotions, though they may not be in as full a supply as more established casinos on the block. This is still a fairly new site at the time of writing – meaning that Nektan will likely bring in more deals and bonus codes as time goes on – but, for now, enjoy their Happy Hour Tuesday promotion – where you can grab extra bonus spins when you play Cleopatra online – additional cash matching and a nice little ‘Privileged’ scheme to keep you interested. There is a definite effort here on the promotion side of things – but there needs to be more offered here for the site to keep up with the bigger competitors. We’re sure the site will beef up in time once interest piles in! Nektan always knows how to get the balance right when it comes to their games and casino offerings – and alongside big name title such as Starburst, Hansel and Gretel and King Kong Cash, this is a site which is always updating its catalogue. There are currently new pickings in the form of Crystal Clear, Icy Wilds, Poltada and Lady of Egypt, which the platform is currently promoting alongside its main deals on-site. There’s also a nice smattering of casino games and instant wins – and while it may not be as comprehensive as some of the bigger sites on the block, there is at least plenty of opportunity for you to easily dip in and out and to play a few different games. Plush Casino is a fancy site with tonnes of features for people to enjoy. Whether you are new to online casinos or not, you are sure to have fun! Check out our Rich Ride Casino review as well for another site we recommend. The site is generally very easy to navigate and it certainly benefits from a fluid, intuitive feel – this works very well on mobile devices as well as on desktop and laptop, too – and everything loads up very quickly. None of the games had any issues during our testing, making for a very smooth and enjoyable playthrough. It’s easy to see why so many people are intrigued by the bonus codes here – as they not only give you a stack of free bonus credit to play with, but you really do have a plethora of games at your fingertips while doing so. Nektan is one of the most dependable mobile casino providers online right now, if not right at the forefront – meaning that you can count on them to bring you solid games from their own engine as well as NetEntertainment software for casinos and other diverse developers. The web design here is arguably Nektan at their very best – it’s one of the quickest sites we’ve browsed, and the games on offer all load incredibly quickly and play without fault. The software and engine here also offers for satisfying casino experiences and instant wins, too – meaning that it’s a platform that truly is built for balance. The only issue some players may have with the software choices here is the fact that many of the games such as Foxin’ Wins are so widely seen elsewhere. Nektan pulls in titles from the most popular developers to build their own unique collections – but for many players, this concept and technique may make things a little samey. To this end, however, Plush Casino does throw in the latest titles whenever they become available, meaning that you are hardly left to dwindle in the usual titles. As the site grows in popularity, we’re certain some more diverse names will pop up – meaning that it is worth getting involved now and grabbing those bonus codes while you can! As this is a site which is clearly geared towards players aiming to win big and win often, the terms for withdrawal are fairly reasonable. Simply make sure you have £20 available in your cashpot to take out. The timescales for withdrawal can vary depending upon the method you use – cards, for example, can take up to 5 days for clearance – though e-wallets are thought to be speedier once standard checks have completed within 72 hours. You can use a wide range of payment options here – from Visa, Maestro, MasterCard and Electron to Skrill, Boku, Neteller and PaySafe Card for online casino. This is a fair coverage – meaning that the majority of players will likely be more than comfortable. Do bear in mind wagering terms, too – it’s thought that a standard 30x will apply – which is very competitive indeed – but it’s always worth keeping an eye on any terms that come your way so that you’re aware of what is expected from you. On the whole, however, Plush Casino is a very fair site – just ask existing customers. This is a site which is clearly built for mobile players, and it follows the Nektan standard in that games and casino elements are quick and easy to launch. Casino mobile gaming is becoming more popular, which is why it is important to make sites mobile compatible. There may not be an official app that is obvious to us at this time, however, the site is responsive enough to even resize to desktop windows – meaning that it is more than flexible for other devices and formats. Simply visit the main site and login with your credentials to access all of the games and promo codes that have been optimised for phones and tablets. The mobile revolution is only just underway – and this applies to online games as much as it does standard browsing. Grab a promotion code and log into the main site from your tablet or phone without fear of missing out. If you are considering signing up to Plush Casino, we would highly recommend the site. There are plenty of fun games, features and promotional offers available so why not sign up, login and get playing now?